NeoTreks Maps - essential for hiking in the US.Locus	NeoTreks Maps - essential for hiking in the US. United states of America offer unthinkable amount of opportunities for hiking enthusiasts. All the same, as the cradle of mountain biking it is a Mecca for MTB lovers from all over the World. Not only numerous National Parks full of monuments known worldwide, but also vast areas of National Forests or various Recreational Areas lure outdoorsmen from every corner of the Globe. Anyway, every active stay in wild nature needs quality maps. Topographic maps of U.S. Geological Survey agency have been part of Locus portfolio for some time. 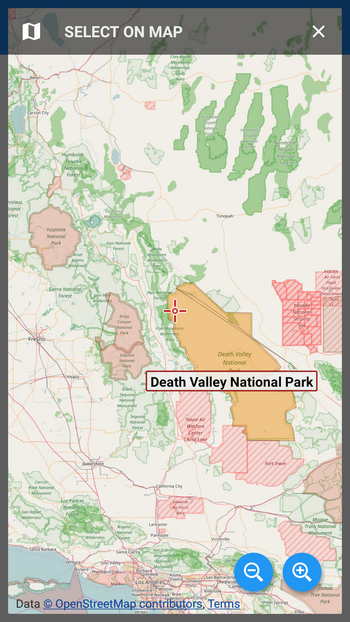 Recently we added also USGS satellite and aerial maps. Nevertheless, all the time there was a strong demand for good maps, depicting in detail the dense network of pedestrian or biking trails, best with some additional information about land ownership. A few years ago we found out about AccuTerra maps. Our competition used them and they had good references in various hiking forums. We were trying to contact their producer for a long time but to no avail. Until last year autumn when the communication barrier was finally broken. To our great surprise we found out that despite the maps were licensed still under Intermap Technologies Inc., they were re-branded and now they are marketed as NeoTreks Maps. Negotiations with the new provider were fast and in October 2016 NeoTreks Maps came to Locus. Why are NeoTreks Maps so special? NeoTreks Maps are a product with solely recreational purpose designed to replace paper hiking maps. They are built by a team of avid outdoorsmen, hikers, cyclists, backpackers, and lovers of the great outdoors. 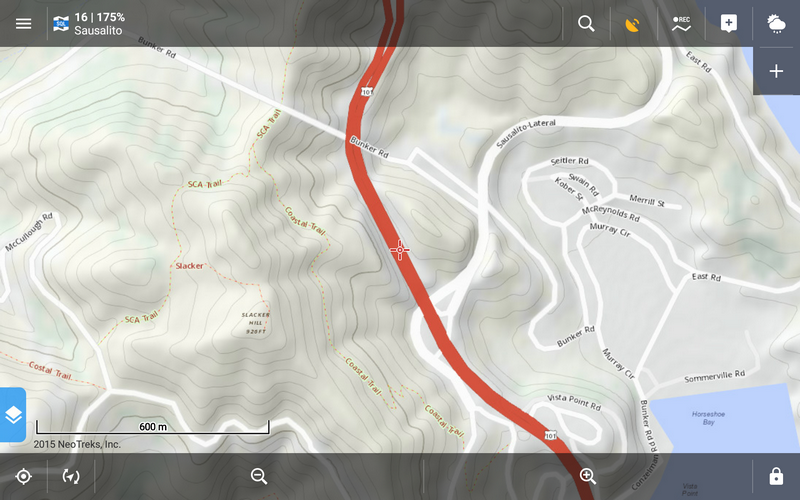 All of them strive for a balance between the simplicity and familiarity of modern web maps, while retaining much of the complex data and information found on the trusted USGS Topographic map series. To create NeoTreks maps, data from every national park, national forest, and BLM office in the country was conflated into a single homogeneous product. Many of the country’s most popular state parks, local parks, and high-use recreation areas were also collected. 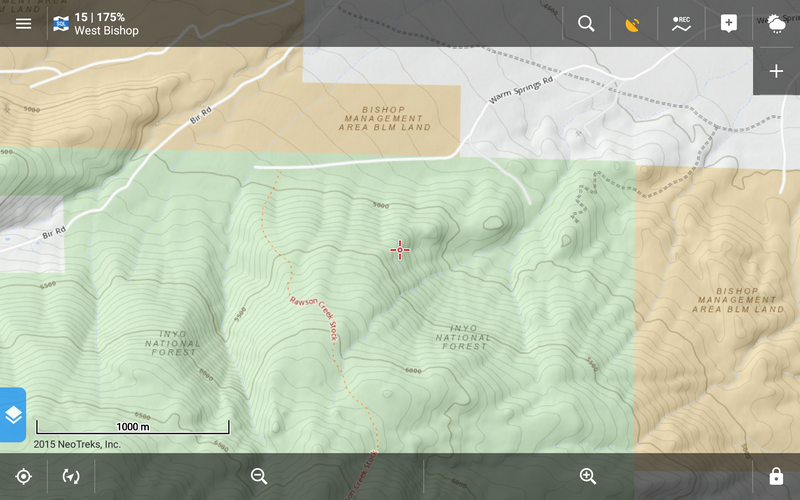 The result is an unparalleled mapping product for recreation and rural use. NeoTreks Maps are offered in Locus in two versions – Land Cover and Land Use. The first of them is a classic topographic map with detailed terrain rendering – subtle contour lines are accompanied by realistic relief shading, hydrology is equipped by annotations and the overall picture is completed by color distinguishing of vegetation areas. Plus, of course, vast array of road network including even tiniest backcountry roads. All topped by a network of 260.000 miles of pedestrian, equestrian, biking, offroading trails and paths for snowmobiles. Land Cover is a topographic base for Land Use layer, mapping land use and ownership. It contains the largest database of its kind – 392 different land ownership classifications representing 3,017 land management agencies – National Parks, Forests, Recreational areas, Wilderness areas, Scenic parks, Preserves etc. 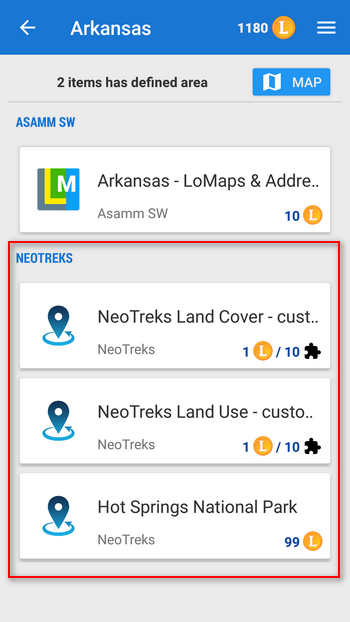 How to buy NeoTreks Maps? or “By provider” name – NeoTreks Maps. 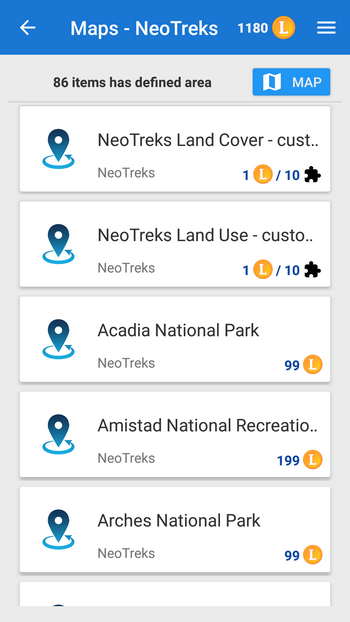 NeoTreks Maps are the perfect companion for any outdoor adventure, from hunting and fishing to backpacking and mountain biking. It’s time to plan you summer vacations with Locus in the US! Sind die NeoTreks Karten auch für Kanada verfügbar? Hi, NeoTreks maps cover only area of United States.